Welcome to the 24 tags of Christmas series for 2015! I love putting this together each year. Well two years in a row at least! If you’d like to see last year’s day one tag, click HERE. Let’s go! I spent time searching the couch cushions to find some time to try out the Prima Water Soluble Oil Pastels – and I think they’ll be fun! 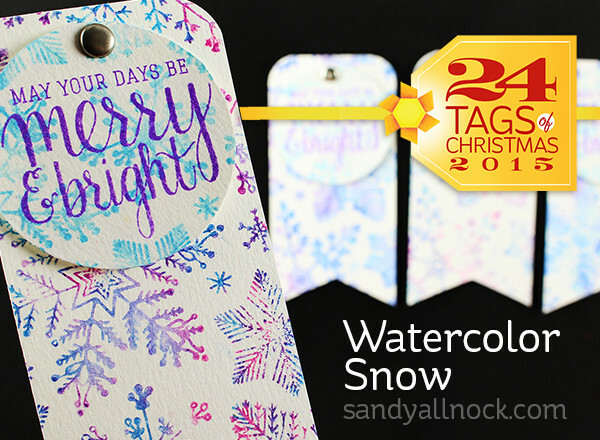 In today’s tag video I’ll show you how I made the multicolored watercolor snowy background…it’s so easy, your kids can help you with it! Check out the video below, or click HERE to see it in HD on YouTube! I love that these Oil Pastels can vary the look based on how much water is added – AND that the color doesn’t re-activate once dry! Perfect to use for kiddos with sticky fingers opening tags this holiday season, am I right? And oh – Postcards or envelope stamping? Yes please. No worrying about the USPS smoodging a stamp! Handmade is the best kind of giveaway! Each year I give away all of the tags made in the series – so there will be 24 winners! To sweeten the pot, I am giving a financial donation to 24 charities in the name of each of the winners – so they’re going to get to pick which charity they love most. To qualify to win, leave a comment on this post with YOUR favorite charity, and a comment on the YT video each day all week. I’ll pick 12 from blog comments and 12 from YouTube comments, and announce them all on Sunday the 15th! Below are links to the supplies I’ve used for today’s project; click on the wording to go directly to the item. Affiliate links may used, which means if you make a purchase I receive a small commission at no extra cost to you. I truly appreciate your support toward the costs of running this blog! Read more. Loved all of your tags, and the Kraft with unicorn in today’s post so very much! The Copic on wood tags were so unique and creative! My favorite charity is the American Behcet’s Disease Association. Being a Behcet’s warrior myself is obviously how I was introduced to the charity. It is an autoimmune disease which is extremely rare….even more so in the Americas. Due to the rarity there has not been enough research on good treatment options because it wouldn’t be financially beneficial for the drug companies. The ABDA has been a huge resource for me and other Behcet’s warriors in the USA. Love and hugs to you for everything you do. God bless! I love these tags… have some of these crayons, just haven’t brought them out lately. St Jude Children’s Hospital. Love this tag Sandy. Such beautiful soft winter colors. My favorite charity is the National Down Syndrome Society. My nephew Cullen is downs and I love the support this organization gives to my brother and his family. Charity… Make A Wish Foundation! I really love the colors on these tags. A really creative idea. My Charity is Angels Among Us Pet Rescue! Your tags are so beautiful!! My favorite charity is a local one, but Tillie Bergen is our St. Theresa, she does so much good. The charity name is Mission Arlington. Love these tags!! Will use this idea for book marks!! My charity is South Colorado Pet Shelters. Thank you!!!! The National MS society… Capital chapter. These tags are just delightful Sandy! My charity is the Preemptive Love Coalition. What an awesome giveaway. Thank you for this. Your tags are cute can’t wait to see the others. Wounded warriors is the charity in like. These are beautiful! I love the color combinations! And I always love watercolors. Thanks for the inspiration! My charity of choice is St Jude Children’s Research Hospital. Simple yet beautiful! Those were so cool and easy even I can do that! Lol My favorite charity is one for Breast Cancer Research or to help Military Families. Really cute tags. My favorite charity is the Cat Adoption Team in Sherwood Oregon. It is a no-kill shelter and frequently takes cats from other shelters around the country. We also have a program that provides cat food to the meals-on-wheels clients with cats. These are so elegant and pretty. I really loike the idea of matching the tags to the paper and also matching (at least the colors and theme) with the Christmas cards, too! Thank you for sharing. My charity is Simply Cats, in Boise Idaho. Love snowflakes!! real and pretend! That background stamp definitely needs to come to my house. Thanks for the enabling?lol! My favorite charity is Homeless in Seattle. Beautiful! And I totally agree with you about the new purple – best one yet! My favorite charity is Heifer International. These are lovely! I think I’ll add that snowflake stamp to my wishlist. It’s wonderful. I had never heard of those oil pastel crayons so it was great to see them used. Thanks! Fave charity is Women for Women International. What a great idea I really would like to try these prima crayons ! Make a wish foundation. Love the tags. Love the color choices. I’m a “newby” so I don’t know what the brads?? are for?? Very Elegant!! Love the colors in your tags my favorite charity is transverse myelitis . Wow they look amazing. Make a wish foundation. Love the tags! My favorite charity is Contra Costa Food Bank. Thank you for the offer of a donation!